Enjoy huge savings on these Homeshow display models now! Delivery of Homshow models will be on Monday, March 18th, Tuesday, March 19th and Wednesday, March 20th. These are mandatory delivery dates for any show pieces . A salesperson will be in touch with you to confirm your order and delivery. There could be time delays on our site causing an item to still appear for a short time after it has sold. You will be notified if this is the case. We apologize for any inconvenience. This Azure freestanding beverage center features digital display control with a reversible door and a blue LED interior lighting. 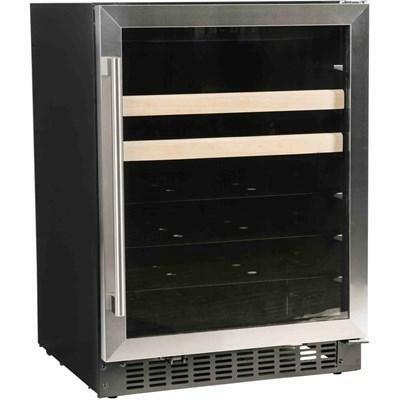 It also boasts 4 glass shelves and 2 wine racks with wood front. 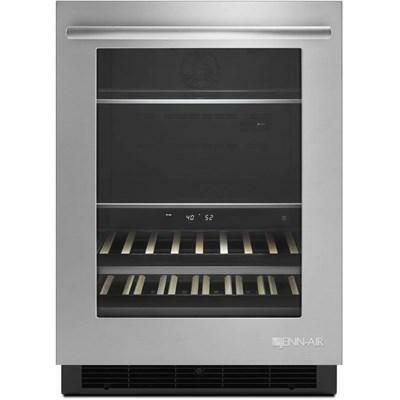 The Jenn-Air® under counter beverage center creates elegant storage options for cheeses, meats and beverages including room for up to 14 bottles of wine. Independent temperature zones and six preset temperatures allow even more customized storage. The fully flush, built-in design with stainless steel exterior ensures that you can install this in any room.